Yesterday, I posted about a recent retreat where I preached on the Good Samaritan eight times in four days. Having studied the text deep and wide, I wrote a modern version of the parable to share with the students in worship. It was a good exercise for me--and I thought you might find it helpful as well--to remember that compassion really can transcend any boundary. And Jesus said to the her (without any sarcasm in his voice at all), "Well, sister, what is our mission statement? How do you interpret it?" She answered, "You shall love the Lord your God with all your heart, and with all your soul, and with all your strength, and with all your mind; and your neighbor as yourself." Jesus responded, "Yep! That’s it! Just do that, and you will live a life that glorifies God not just now but for all eternity." She had another question, though. "But Jesus. Exactly who would you say is my neighbor?" "A business man was in the habit of exercising after work. At the office, he’d change from business attire to gym clothes, place his valuables in his backpack, and walk over to the downtown YMCA for a work-out before going home. One night, as he headed back to his car over near his office, he was jumped from behind and mugged. They stole all his credit cards, his iPhone, and his laptop. Then, they beat him and left him--broken, bloody, and unconscious--to die. “Now by chance, the senior pastor of World’s Biggest Church was leaving a ministry meeting in the city and happened to walk right by the unconscious man. The thing was though, he still needed to update WBC’s website and Facebook page before he could go home; he hurried on to his office, asking Siri to remind him to look into the matter later. “Likewise, the leader of the homeless ministry happened upon the injured man; of course, any other time, she would have stopped. (She would have!) But that night, she was on her way to B-SUB (Bible Study Under the Bridge), and she knew there would be a big crowd waiting on her. She kept walking. And the woman said, “Um, well, in that story, I guess it would be the . . . uh . . . the one who showed him mercy." I love this. Though I can hear some humor in your voice, I also know that you're completely serious about what is an important issue. I'm in a writing group that "meets," in a sense, on Facebook. The women & men in The Inky Path are Jewish, Muslim, Christian, Catholic, and possibly every other denomination - not everyone discusses that. There are also gay, straight, parents, childless, married, divorced... Lately, people have been struggling with all of the hate - Orlando, Trump & his supporters, more - and luckily they write about it because then it becomes more understandable to me. One woman wrote of living in Yemen as an American Muslim and a soldier touching her heart - making that same Good Samaritan connection you mentioned today. Another shared her 14 year old daughter's post on her social media account talking about stopping the hate. It's inspiring. I'm not very religious, but I am very spiritual and it gives me heart to read your posts. So glad to hear this Jennifer. I enjoy your posts as well. The writing group sounds fantastic. I am greatly saddened by the torrents of hate in today's dialogue. It sounds like your group is bringing people together for meaningful conversation. That, I believe, is the answer. Thanks for sharing your thoughts! Great job. Your modern adaption turned out awesome. Thanks! It's good to place such stories into our time, I think. It actually helps me to understand the message better when I interpret it for my 21st century mindset. Amen! I think that's what Jesus did. So many of the parables that he told are retellings of Old Testament stories updated for his audience. Love this. 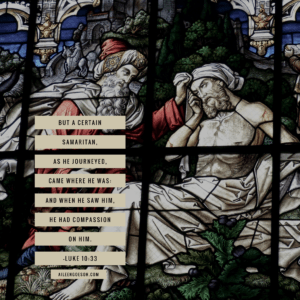 Sometimes I wonder if the parable of the Good Samaritan is so easily adaptable to current situations because it's the lesson we need to keep learning over and over. Great point! It is a difficult lesson to learn, that's for sure!